There is a stunning formation known as Australia Rock located at the northern end of Surf Beach in Narooma on the far south coast of NSW. It can be seen at the bar crossing at Wadonga Head, where the inlet empties into the sea. With a bit of imagination you can see the shape of Australia cut into the rock wall. It was accidentally created many years ago when a ship was tied to the rock with large chains to prevent it from washing away. The chains wore away the rock during rough seas and it has been known as Australia Rock ever since. However with constant salt, wind and ocean waves it is gradually changing so it will not be there forever. This image belongs to the travel and nature stock photo library. This stock photo of Australia Rock is available for licensing for commercial and editorial uses including websites, blogs, books, magazines, brochures and advertising. Restrictions may apply for images which contain third party copyrighted material or sensitive subjects. Photos of artwork are for editorial use only. 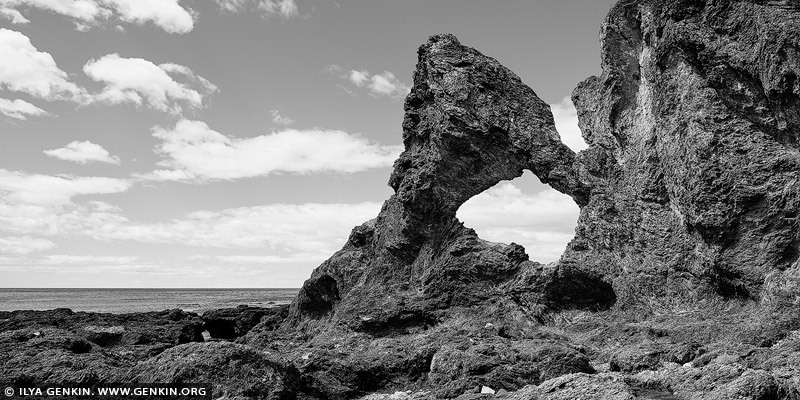 This image id AU-NAROOMA-AUSTRALIA-ROCK-0001 of Australia Rock, is copyrighted © by Ilya Genkin. This is not a public domain image.